Images, pictures & photos of Beaumaris Castle, built in 1284 by Edward 1st, considered to be one of the finest example of 13th century military architecture by UNESCO. A Unesco World Heritage Site. Beaumaris, Anglesey Island, Wales. In 1282 when Edward the 1st had finished his initial campaign against the Welsh lords, he set about building a series of defensive castles to assure that his control over Wales would not slip. Beaumaris Castle was the last of these great castles to be built and was engineered as the the state of the art castle of its day. Beaumaris Castle is surrounded by a moat which use to link to the sea so the castle could be provisioned easily. The outer walls of the castle have 2 round towers along each side which give a vantage point to defending soldiers. Inside this is another higher wall with bigger towers which not only allows defenders to see over the outer wall, but should the outer wall be breached a killing zone would be created between the inner and outer walls. The inner ward had accommodation for 2 major households, presumably for Edward when he visited and his local lord. Building so many great Castles in Wales drained Edward 1st finances and in 1284. The Madog ap Llywelyn uprising in 1295 forced Edward to resume building Beaumaris Castle but in 1306 funds had to be diverted to fight the Scots who threatened invasion of England. Work finally ceased around 1330 and a total of £15,000 has been spent building Beaumaris which was a staggering amount of money at the time. Even though Beaumaris Castle was never fully completed its remains are impressive, especially when viewed from a distance with the sea and the mountains of Snowdonia as a backdrop. 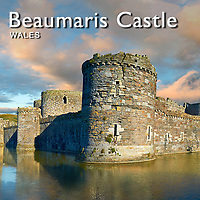 Historian Arnold Taylor described Beaumaris Castle as the most perfect of the Welsh castles and praised its symmetry. His views are supported by UNESCO who added Beaumaris to its World Heritage site list stating that it is "the finest examples of late 13th century and early 14th century military architecture in Europe"
Edward 1 financed his wars and castle building by initially borrowing money from the Jews in England and from the Florentine bankers. As Edwards debts grew greater he started taxing the Jews harder until finally, in 1290, he expelled the Jews from England taking their land and property. The debts Edward 1st left on his death in 1307 were staggering and in 1340 Edward 111 defaulted on his loans to the Florentine banks owing the £150,000. Needless to say this ended the glory days of Florence.